Flagstone's HydroStone, like Diamond Turf Block, provides an environmentally sound alternative to non-permeable paved services. 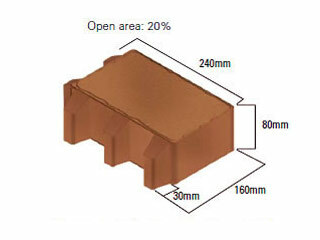 The 20% opening allows water to drain into and through a permeable designed base. Water can then be absorbed into the ground or directed into retention ponds or subterranean water storage systems. HydroStone is made to the same specifications as our interlocking pavers so it can withstand vehicular traffic. It's 80mm (3 1/8") thickness makes it appropriate for roadways, overflow parking, parking stalls or other heavy vehicle traffic. Due to the large opening, HydroStone is not recommended for pedestrian areas. See product chart for English square footage and other information. See Product color run sheet for available colors. * English measurements are nominal. Exact dimensions are shown metrically as installed measurements.